I LOVE gardening. Can't say I have a green thumb just yet but learning about plant life and creating resources for my children is my goal. This year's plant study includes older students who were will more about the actual chemical process of photosythesis, identifying monocot and dicot flowers. We will continue to talk about companion planting, organic gardening and composting. All these resources have been gathered over the course of 2 years. ENJOY our botany, plant science unit study. Nutrients for Life posters, games, flashcards and other materials available for free to teachers/homeschoolers designed for 3 - 4th graders. GREAT FOUNDATION for a plant biology lesson. Planting gardening is part of curriculum. There are also downloadable lesson plans for middle to high school students on the site. Send a Cow resource from the UK about a type of gardening that is used in aerid regions of africa. We built our own and its fairly successful going on our second year. Nourish. Oh I LOVED this DVD. The kids watched it twice and learned so much from it. The importance of organics and realizing WHERE our food originates. Context: Flowers come in all shapes, sizes, and colors. Context: When you look at a forest in summer, you can see the green leaves of trees. Context: Photosynthesis allows plants to make their own food. Context: Roots hold the plant in place. Context: A new plant will come from the seed. Context: The stem pokes up through the soil. Homeschool Share. EXCELLENT resource for both lesson planning using literature as a base and printables for lapbooking/notebooking. 3 different levels of learning great for a mixed aged group setting. 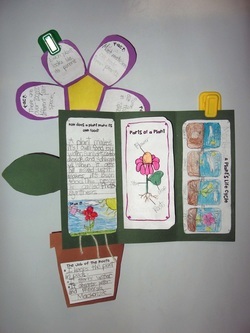 these blogs have wonderful examples of completed lapbooks. Many do NOT have the actual printables but its wonderful inspiration.